What is The Emergency Temporary Diet? The Equine Cushings and Insulin Resistance (ECIR) group, co-owned by equine nutritionist and author Eleanor Kellon, VMD, has long supported using a low sugar/low starch diet for horses showing signs of laminitis, founder, insulin resistance (IR) or Cushing’s disease (PPID - pituitary pars intermedia dysfunction). The Emergency Temporary Diet by Dr. Eleanor Kellon as posted on the ECIR group is not intended as a long-term complete diet but as an initial measure to bring symptoms under control until hay can be analyzed to check for suitability and mineral balancing. While some horses may begin to show improvement right away when high sugar/high starch triggers are removed from the diet, most won’t show real changes until their diet has been balanced and their trim optimized for a few months. I have slightly modified the ECIR Group Emergency Diet (with permission from Dr. Kellon) and added some suggestions based on local Southwest availability. The complete article can be read on my website www.desertequinebalance.com and a pdf version is available there to download and print. These are the only basics your horse needs until you have had an opportunity to take a deep breath and sort things out. Horses lived and evolved for thousands of years on the nutrition basics provided by forage and salt - your horse does not require any additional bagged feed in most circumstances. However, the “emergency” diet is a temporary measure and will, at some point, need to be mineral balanced. 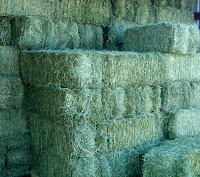 The ideal way is to have your hay analyzed and use a custom supplement based on the results of the analysis. The analysis will also give you information on digestible energy (DE - calories/energy) which will help guide the amount you need to feed, and crude protein (CP), sugar, starch and mineral levels. Feeding a custom supplement based on your hay analysis may often cost less than using a quality “off the shelf” supplement. If unable to test your hay there are options for addressing deficiencies and excesses using regional supplements. Don't spend your hard earned money on expensive specialized supplements until you understand what your horse needs. There are no magic bullets in a bag or bucket that will take the place of an accurate diagnosis, eliminating excessive sugar and starch from your horse's diet, a correct balanced trim and exercise (summarized by Dr. Kellon as DDTE). Once DDTE has been addressed you can take your time finding the most appropriate and cost effective supplements for your horse. While both Omega-3 and 6 are essential, maintaining ratios similar to that of natural forage is likely optimum (Kellon, Nutrition as Therapy) and horses on hay diets with little or no access to good pasture should be supplemented with an omega-3 source. Cured forage rapidly loses it omega-3, and many other popular supplements such as rice bran and black oil sunflower seeds (BOSS) are high in omega-6. For example, to "balance" the omega-6 in two ounces of rice bran you would need four to six ounces of flax or four to six Tablespoons of flax oil. It would take six or more ounces of flax to balance the omega-6 in one ounce of BOSS. Flax seed also quickly loses its omega-3 activity after grinding unless refrigerated immediately or milled using a special process to stabilize the fatty acids. You can estimate the amount of omega-3 and 6 in several different additives using the Excel calculator at http://www.desertequinebalance.com/supplements/omega-3. A PDF version is also included for reference. You're not likely to achieve perfect "natural forage" omega-3 to 6 ratios but this can help you keep a more natural balance and avoid feeding excess omega-6 in additives. There is also a newly updated chart of products supplying omega-3 fatty acids that you can use to compare daily cost. The obvious front runners in cost were "generic" flax seed and flax oil. Next in line are three "stabilized" products: HorseTech's NutraFlax, Omega Fields' Horseshine and Triple Crown's OmegaMAX. Karron Oil, once a Horse Journal top pick, is currently unavailable in the US. Platinum Performance weighs in with Equine Healthy Weight, flax oil which uses vitamins C and E as preservatives. Chia seed is fairly equivalent to flax seed in omega-3 content. It remains pricey but this may be made up for by the convenience of being able to feed chia seeds whole without grinding. I'm not a fan of giving any animal-based products to my horses so only one product containing fish oil is included. It has not been conclusively shown that the form of omega-3 in fish oil is well utilized by horses (as it is in humans). There has been no documented evidence that either flax seed or chia seed can prevent sand build up or clear sand from the horse's digestive tract. Until this has been clearly demonstrated you should follow your veterinarian's suggestions for sand build up prevention. I hope you find this information useful - it isn't always simple to balance cost vs need or convenience. 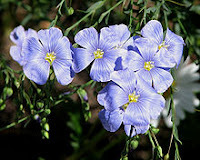 Desert Hoofprints in 100+ degree Arizona where flax flowers grow under my bucket washing rack. Normally this time of year I would be thinking of writing an article on how much water our horses need or if we're guarding the nutrients in our supplements and feed from the heat. But a discussion on deciding how much care and effort is appropriate for a foundered horse - especially when there is conflicting advice from veterinarians and friends - had me looking again for this article - WHEN IS THE RIGHT TIME TO SAY GOODBYE? These are always difficult decisions and there is seldom a clear cut "right" or "wrong". Many of us have experienced guilt wondering if we did enough or we realized we have waited too long and "goodbye" has become an emergency trip to the vet. Written by Susan Garlinghouse, DVM, highly regarded Endurance veterinarian and rider, "WHEN IS THE RIGHT TIME..." is a guide to help owners objectively determine if it's "too soon" or if it is time for this final act of kindness. "Just as with anything data-point related, the longer the list, probably the more accurate it will be in defining the animal's life. 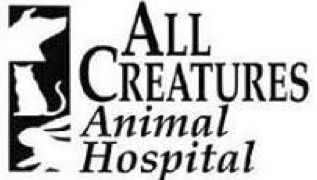 Start crossing off the list items as the animal no longer can or will do them, or only does so with great difficulty. Don't cheat." Every pet and animal owner will face these decisions at some time. Having a copy of these guidelines might not make it any easier but will give us the confidence and comfort that we are acting wisely. Dr. Garlinghouse has long been considered the "equine nutrition guru" of endurance riders. See her endurance-related nutrition articles and, of course, "The Famous Squirrel Story" at the clinic website.